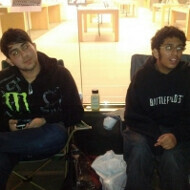 "Let's go and line up for the new iPad/iPhone/MacBook Air" has apparently become as favorite a pastime as countless nights spent playing Battlefield 3, judging from the hoodie of a certain individual who is already in the queue to get Apple's newest tablet - which gets released on Friday! 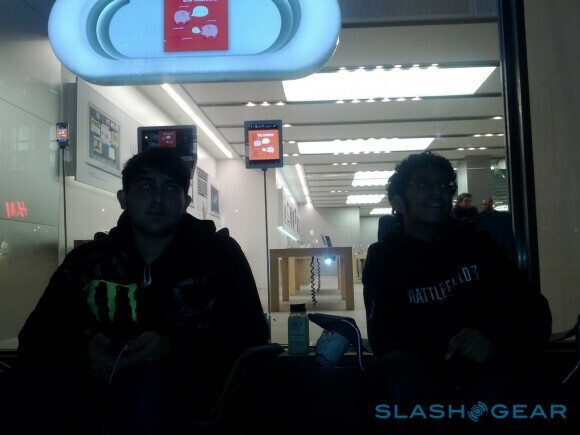 SlashGear has snapped a few photos in front of an Apple Regent Street Store in London, that show two teens, Ali and Zohaib, already lining up, folding chairs and all, to be one of the first in London that will be getting their hands on the newest Apple goodness. You know, days before everyone and their toddlers in London get it, but still way behind any Australian with OCD about getting the latest iPad first - pesky timezones! Pre-orders have dried out for the new iPad, and delivery wait times have slipped to 2-3 weeks, so the only way Ali and Zohaib's queue fever can be justified is if they plan to jack up the price and sell the high-res iPad on eBay to willing buyers. OCD - Obsessive Camping Disorder.. and not a single f, sorry, iPad, was given that day..
LMAO, what idiots. Excuse me, iDiots. Really speaks volumes though, even the drones are starting to wake up and realize that appl has been selling them the same damn product for years.